- The mantle is the layer between the crust and the outer core. - It is about 2,890 km thick! 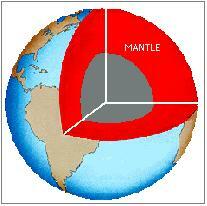 - The mantle is about 84 percent of Earth's volume. - The mantle is the largest layer of the Earth. - The mantle is made up of of many things including magma. - The boundary between the crust and the mantle is called the Moho. - The mantle is split into two different layers. The upper layer and the lower layer. - The upper layer of the mantle is made of solid rock. - It is approximately 1000 °C. - The lower layer of the mantle is plastic like, like taffy or caramel. - It is approximately 2500 °C.